Mark James Simkins Jr., also known as M.J., was passionate about his family, faith, football, and friends. His family chose to endow a scholarship at the University of Montana Western where his legacy will be remembered forever. 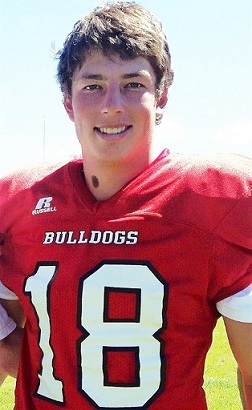 M.J. was active in his community, excelled academically, and was a leader on and off the football field. The Forever M.J. #18 Scholarship was awarded for the first time this spring to J.D. Ferris and Jake McElroy for the 2018-19 academic year. “J.D. and Jake share M.J.’s passion to teach, coach, and make a difference in the lives of our youth,” said Kathy Simkins, M.J.’s mother. The scholarship criteria specify that recipients must be education majors, maintain a 2.5 GPA or higher and be a football player in good standing with the university. “There is much more to life than the game of football. It’s all about the memories you create along the way with the great people you meet,” wrote McElroy in his thank you letter to the Simkins family. M.J. was one of McElroy’s first friends at Montana Western. Both recipients feel honored to represent this scholarship in its foundational year. Ferris was a lifelong friend of M.J.’s. The support received from friends and family has helped to endow this scholarship at the Montana Western Foundation. “The outpouring of love and support towards this young man and his family is truly remarkable. The foundation is honored to be able to offer this scholarship to student-athletes who will forever represent the characteristics that M.J. personified,” commented UMW Foundation Executive Director Roxanne Engellant. M.J.’s high school classmates organized a wristband fundraiser, while his Montana Western friends sold T-shirts in his honor with the phrase “All Dawgs go to Heaven.” The Simkins family then contributed all of the funds raised directly to the Football Program to assist with upgrades to the football locker room in the B.A.R.C. facility. The scholarship and locker room project fall in line with M.J.’s passion for “making it better for the next one up!” In one of M.J.’s previous interviews, he stated that he wanted to leave this place better than he found it. Those wishing to contribute to the Forever M.J. #18 Scholarship can contact the UMW Foundation by calling 406-683-7305, by donating online at umwfoundation.org or donations can be mailed directly. Please address donations to the Forever M.J. #18 Scholarship Fund, C/O the UMW Foundation, 710 S. Atlantic St., Dillon, MT 59725.